Port Moody, British Columbia, sits on the eastern edge of Burrard Inlet, on the outskirts of Vancouver. To the north are Belcarra Provincial Park, Indian Arm fjord, and Mount Seymour Provincial Park. To the south, the city of Coquitiam and the Fraser River. Port Moody is a popular spot to enjoy the outdoors. 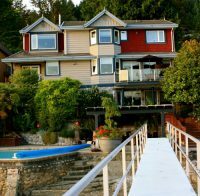 Spend the weekend at a Port Moody Bed and Breakfast and relax into a new routine. Golfers will be drawn to the scenic course on nearby Westwood Plateau. Walkers, joggers and cyclists will enjoy the trails and parks that hug the crescent shaped shoreline. Fishermen and swimmers should head to Sasamat Lake in Belcarra Regional Park. Water sports enthusiasts will find the calm waters of Burrard Inlet delightful for paddling and paddle boarding. The inlet leads to Indian Arm fjord, which reaches 30 km north into BC’s Coast Range, and is only accessible by boat. The fjord is surrounded by old growth forest and roaring waterfalls, and is home to a wide variety of wildlife. A strong arts community is developing in Port Moody. A Canadian Film Festival takes place each February, and a multicultural Festival of the Arts occurs each fall. The Port Moody Arts Centre showcases an evolving series of local, regional and international artists throughout the year. The citizens of Port Moody come together for two festivals annually: they celebrate the release of salmon fry into the river system during the Fingerling Festival in the spring; and commemorate the construction of the Canadian Pacific Railway line and Port Moody Station during Golden Spike Days in the fall. 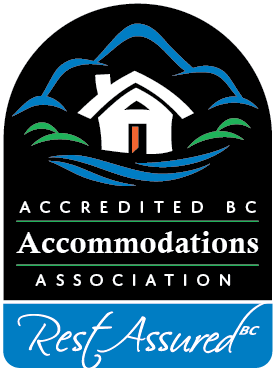 A stay at a Port Moody Bed and Breakfast offers some of the best that British Columbia has to offer: beautiful forests, mountains and waterways just minutes from a pleasant town. Explore Burrard Inlet: Drive or sail to a remarkable treat in B&B hospitality, natural beauty & water activities. Choose from 3 B&B Rooms:”Suite Memories”/”Captain Suite”/”Suite Serenity”:all with spacious en suites.Discover this B&B gem with its multi-faceted appeal; couples hideaway or family fun!